The Licht research group has taken on the challenge of a comprehensive solution to climate change. We’re working towards changing today’s fossil fuel, to a renewable chemical economy, replacing the largest greenhouse gas emitters, including iron & fuel production by new, inexpensive, solar, CO2-free, chemistries. A new fundemental solar process has been introduced. This STEP process efficiently removes carbon from the atmosphere and generates the staples needed by society, ranging from fuels, to metals, bleach and construction materials, at high solar efficiency and without carbon dioxide generation. By using the full spectrum of sunlight, STEP captures more solar energy than the most efficient solar cell or photoelectrochemical processes. 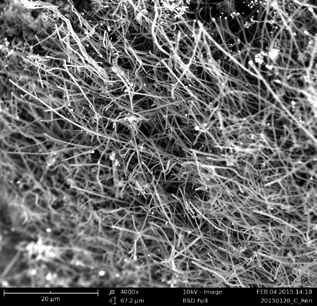 Sunlight converts CO2 to carbon nanofibers (shown) and drives new CO2-free syntheses for iron, cement and fertilizer. The Licht group’s C2CNT process CO2 to carbon nanotubes and drives new CO2-free solar syntheses for iron, cement and fertilizer. In the field of energy storage for devices ranging from EVs to consumer electronics and peak power storage, we’re pioneering the study of new multiple electron (per molecule) storage processes, to learn to create batteries and fuel cells with greater storage capacity than gasoline. En route to new renewable energy pathways, our explorations range from water thermodynamics to new environmental methodologies & from quantum mechanics to H2, halide, chalcogenide & transition metal chemistry. Licht, “Co-Production of Cement and Carbon Nanotubes with a Carbon Negative Footprint,” J. CO2 Utilization, 18, 378 (2017). Ren, Johnson, Singhal, Licht, “Transformation of the greenhouse gas CO2 by molten electrolysis into a wide controlled selection of carbon nanotubes,” J. CO2 Utilization, 18, 335 (2017). Cui, Xiang, Liu, Xin, Liu, Licht, “A novel rechargeable zinc-air battery with molten salt electrolyte,” J. Power Sources, B 342, 435 (2017). Cui, Xiang, Liu, Hongyu Xin, Liu, Licht, “A long cycle life, high coulombic efficiency iron molten air battery,” Sustainable Energy & Fuels, 1, 474 & back cover (2017). Wu, Ji, Li, Yuan, Zhu, Wang*, Zhang, Licht, “Efficient, high yield carbon dioxide and water transformation to methane by electrolysis in molten salts,” Advanced Materials Technology, 1, 60092 (2016). Zhu, Wang, Wang, Liu, Wu, Licht, “Solar Thermoelectric Field Photocatlysis for Efficient Organic synthesis Exemplified by Toluene to Benzoic Acid,” Applied Catalysis B, 193, 151-159 (2016). Dey, Ren, El-Ghazawi, Licht, “How does amalgamated Ni cathode affect Carbon Nanotube growth? A density functional theory study,” RCS Advances, 6, 27191 (2016). Li, Liu, Cui, Lau, Stuart, Licht, “A one-pot synthesis of H2 & carbon fuels from H2O & CO2” Adv. Energy Mat., 7, 140179 (2015). Zhu, Wang, Liu, Wang Licht, “Towards efficient Solar STEP Synth. Organic,” Solar Energy, 113, 303 (2015). Li, Licht, “Advances in … the synthesis of ammonia from air & water ..,” Inorg. Chem., 53, 10042 (2014). Zhu, Wang, Liu, Wang, Wu, Licht, “STEP Organic Synthesis,” Green Chemistry, 16, 4758 (2014). Licht, Cui, “A Low Temperature Iron Molten Air Battery,” J. Materials Chemistry A, 2, 10577 (2014). Licht, Cui, Stuart, Wang, Lau, “Molten Air Batteries – A new, highest energy class of batteries,” Energy & Environ. Sci., 6, 3646 (2013). Farmand, Licht, Ramaker, “Studying Multi-electron Charge Transfer in Fe(VI),” J. Phys. Chem. C., 117, 19875 (2013). Cui, Licht, “Critical STEP advances for sustainable iron production,” Green Chemistry, 15, 881 (2013). Licht, Wu, Hettige, Lau, Asercion, Stuart, “STEP Cement: CaO without CO2” Chem. Comm., 48, 6019 (2012). Wang, Wu, Zhang, Licht, “STEP Wastewater Treatment,” ChemSusChem, 5, 2000 (2012). Licht, “Efficient Solar-Driven Synthesis, Carbon Capture, and Desalinization, STEP,” Adv. Mat., 47, 5592 (2011). Licht, Hodes, Tenne, Manassen, “A Light Variation Insensitive High Effic. Solar Cell,” Nature, 326, 863 (1987). Licht, “A Description of Energy Conversion in Photoelectrochemical Solar Cells,” Nature, 330, 148 (1987). Licht, “pH Measurement in Concentrated Alkaline Solutions” Analytical Chemistry, 57, 514 (1985). Licht, Cammarata, Wrighton, “Time/Spatial Dependence of <105 Molecules,” Science, 243, 1176 (1989). Licht, Peramunage, “Efficient photoelectrochemical solar cells,” Nature, 345, 330 (1990). Licht, Peramunage, “Efficiency in a liquid solar cell,” Nature, 354, 440 (1991). Peramunage, Licht, “A Novel Solid Sulfur Cathode for Aqueous Batteries,” Science, 261, 1029 (1993). Licht, Wang, Ghosh, “Energetic Iron(VI) Chemistry: The Super-Iron Battery,” Science, 285, 1039 (1999). 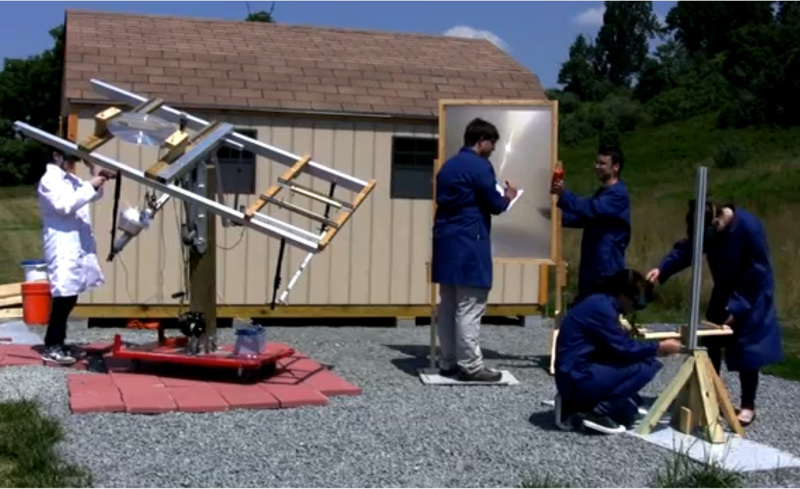 Licht, Wang, Mukerji, Soga, Umeno, Tributsch, “Over 18% solar conversion to H2 fuel; …,” Int. J. H2 Energy, 26, 7 (2001). Licht, Halperin, Kalina, Zidman, “Electrochemical Potential Tuned Solar Water Splitting,” Chem. Comm., 3006 (2003). Licht, Wu, Yu, Wang, ” Renewable Highest Capacity VB2/Air Energy Storage,” Chem. Comm., 3257 (2008). Licht, “STEP: A solar chemical process to end anthropogenic global warming,” J. Phys. Chem. C., 113, 16283 (2009). Prof. Stuart Licht completed his Ph.D. at the Weizmann Institute, and a Postdoc at MIT. Prior to joining the faculty at George Washington University, he served as a Program Director at the NSF, was Chair of Chemistry at UMass, and has received awards including the 2017 Hilldebrand Award, the 2016 BASF 150 th Anniversary Energy Storage Award, the Electrochemical Society Energy Technology Research Award, the Alcoa Aluminum Foundation Science Prize, the Trachtenburg Prize of the George Washington University, the Gustella Award of the Technion, and held the Carlson Endowed Chair in Chemistry at Clark University. For further information, contact Prof. Stuart Licht, George Washington University, slicht@gwu.edu. More information on The George Washington University can be found at www.gwu.edu. GWU’s Foggy Bottom Campus is located four blocks from the White House, and GWU’s Science & Technology Campus is located near Dulles Airport, in Ashburn, VA.
More information about the Chemistry department at GWU is found by following the link.